Jo Scott and Barra Best introduce highlights from this year's fundraising extravaganza. Including a look at how donations help children in Northern Ireland. Browse content similar to Northern Ireland's Best Bits. Check below for episodes and series from the same categories and more! We have a packed programme. worked to sing you a classic song. # She's on my mind! million. The work is very targeted. like this one just outside Belfast. the teachers wanted him to. Belfast Med for the boxing Academy. myself. Co-I could do it. up every day and come to this job. them in terms of their learning. for boxing and get fit. donations really make a difference. the West End in Albert Square. # Such a sky you never did see. rehearsing, come and have a listen. it's just really fun to do. really do come true #. going to get my chance. choirs to see how good they are. all my friends and just sing. to be celebrities as well. we're going to smash it. of somewhere Over The Rainbow. First, more from our fundraisers. Pac man to be able to eat them? # Am I a monster? # What will your family think of me? has affected every part of his life. athletic young boy and sociable. has witnessed her brother's decline. It was just the word "hospice"
We did go to Horizon House. you know, they love it. that Gracie had it, too. It's a very, very cruel disease. the heartache that you feel. was going to be like before. and to donate go to the web-site. thing without doing it ourselves. A wee practice. You did not? to let any of it stick. to tell us when you're finished. Spillage, Jenny, note the spillage. Look at us go! All right. not Strictly, you know that. I'm all about taste not haste. Very high in the seasoning. seconds. It is quite well seasoned. nice. This is the best cooked. 17, because of the speed. keep on coming. Don't they Barra? I can do Heather Small. I can't do this any more. than it is on the outside. You know, I thought it probably was. Technically, that is your Tardis. It's about 70 feet that way. See? Always remember where you parked. It's going to come up a lot. Madness was never this good. Judging by the uniform, yes. What do you mean, one? Er...you know who I am. You knew the moment you saw me. but I kind of know what's coming. the faintest idea who you are. Well...I know who you are. Yes. I'm very much afraid so. but you get there in the end. drinking, can I buy you another one? is it like to have a disability. I love all the dance. My favourite part, I get to dance. such a difference to young people. friends at the end of the programme. grateful to Children in Need. the website. Do your thing. to the Castlewellan Forest Park. special outdoor event taking place. sunshine, we quite like it. doing it the easy way, isn't it? and if I need to stop I'll stop. to join in the ramble. good. The paddling was difficult. to deal with their tiredness. first-hand how it transforms lives. you affected by Williams syndrome. They don't judge us whatsoever. is taking its toll on Aisling. catch up with the others shall we? friends from Yes at the finish line. bids we get we'll take them. I'm 17 and I identify as non-binary. is that experience isn't all good. is always an another option. of young people in Northern Ireland. Ireland Children in Need Choir. they're going to sing just for you. 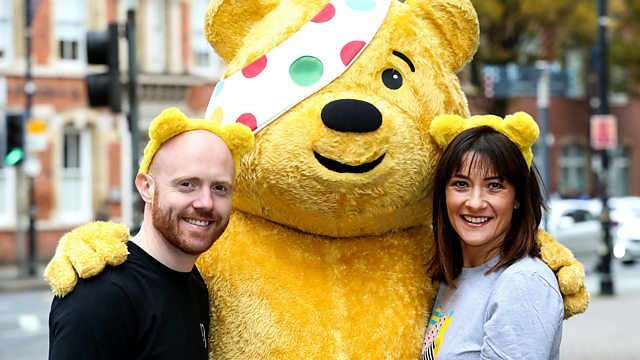 Jo Scott and Barra Best introduce highlights from this year's Children in Need fundraising extravaganza. Expect all the fun with Pudsey and our fundraisers, plus a sprinkling of stardust from our musical guests, including the wonderful Children in Need choir. We also take a look at how your donations help in Northern Ireland.